UPDATE: We're bringing the popular Rags to Riches Theatre back to The Clayton Center, but we need to reschedule the free event until a new date in January. The performers are snowed in and will not be able to make the Dec. 11 appearance. We'll share the new date as soon as possible! A Fresh Newsletter Just for Hocutt-Ellington Memorial Library! We've added a special newsletter just for the library. Want to receive these newsletter directly in your email? Click here to subscribe to Clayton Library Newsletters every month! December is Delicious at the Library! This December, you can pay your library fines by bringing in nonperishable food items! We're also accepting food donations from anyone who wants to donate (with or without fines). We're excited to give a little back this season! For each nonperishable food item you donate, we will waive $5 of overdue fines - please note: this does NOT apply to lost items! All donations will go to the Clayton Area Ministries food bank to help needing family in the Clayton area. 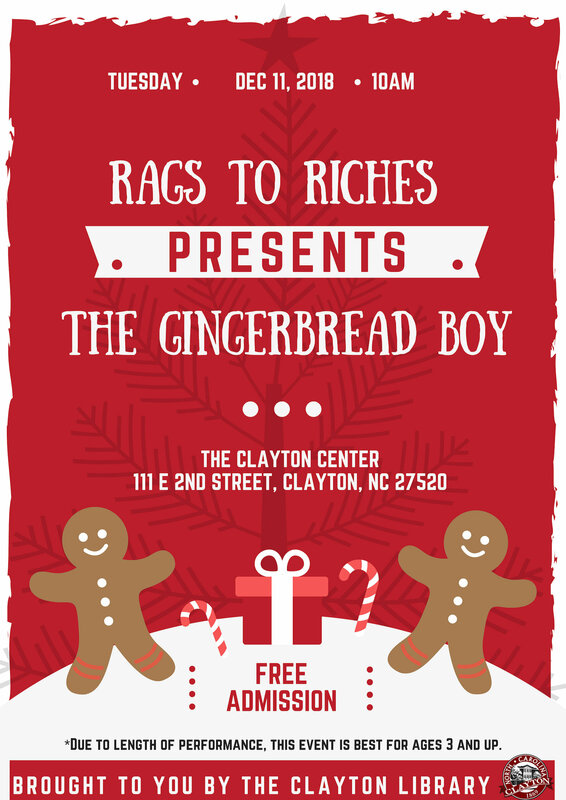 Rags to Riches Presents: The Gingerbread Boy - Postponed due to weather! We're bringing the popular Rags to Riches Theatre back to The Clayton Center, but we need to reschedule the free event until a new date in January. The performers are snowed in and will not be able to make the Dec. 11 appearance. We'll share the new date as soon as possible! Parents and children are welcome to join us in the Clayton Center Auditorium for this FREE, fun, and interactive holiday play! The show runs about an hour and is best suited to children over 3 years old. The Clayton Center is located at 111 E. Second Street in Downtown Clayton. For questions about this event, please contact Youth Services Librarian Laura McGuire at lmcguire@townofclaytonnc.org. Families, we want your input about the future of our library! We're holding two fun, informal focus groups on Thursday, December 13th. Take this chance to tell us what you want to see from us in the future. We'll hold a morning session from 9:30 to 10:30 a.m. and an afternoon session from 4:00 to 5:30 p.m. Bring yourself and your family, and we'll bring the cookies! Space is limited, so choose a session and let us know you're coming! Email your RSVP to Library Director Joy Garretson at jgarretson@TownofClaytonNC.org, call 919-552-5542 to reserve your spot, or sign up at one of our circulation desks. We're taking a break from our regularly-scheduled children, teen, and adult events this month. We hope you'll be able to connect with us during one of our special events. And as always, we have plenty of awesome books for you to check out. Happy Holidays!